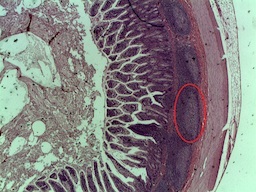 T cells that are important early targets of HIV infection reside in gut-associated lymphoid tissue, shown here courtesy of Wikimedia. An antibody that "masks" these cells, targeting alpha-4-beta-7 integrin, can reduce the risk of viral transmission in a non-human primate model. Cloaking immune cells with antibodies that block T cell trafficking to the gut can substantially reduce the risk of viral transmission in a non-human primate model of HIV infection, scientists report. The findings suggest that drugs that are already in clinical trials for inflammatory bowel diseases might be effective in the treatment or prevention of HIV infection. The results were published Monday in Nature Medicine. "We were surprised by the effects that we observed," says senior author Aftab Ansari, PhD, professor of pathology and laboratory medicine at Emory University School of Medicine and Yerkes National Primate Research Center. "Our goal was to demonstrate that blocking CD4+ T cell trafficking to gut tissues could decrease the level of virus in the gut and help mount an effective immune response, but we found that administration of the antibody could actually prevent transmission. The results of this study suggest that this form of therapy could counteract pathologies that lead to gastrointestinal symptoms and poor outcomes in HIV infection. Exploration of how this could be combined with anti-retroviral drug regimens is warranted." The co-first authors of the paper are Siddappa Byrareddy, PhD, Emory assistant professor of pathology and laboratory medicine, and research specialist Brianne Kallam, now in graduate school at the University of North Carolina. Collaborators included Janet McNicholl, MD and Ellen Kersh, PhD, at the Division of HIV/AIDS Prevention, Centers for Disease Control and Prevention (CDC); and James Arthos, PhD, Claudia Cicala, PhD, and Anthony Fauci, MD, in the Laboratory of Immunoregulation, National Institute of Allergy and Infectious Diseases (NIAID), National Institutes of Health. Other collaborators at Emory University, the University of Massachusetts, the German Primate Center in Gottingen, the CDC and Georgia Institute of Technology played key roles. CD4+ T cells found in the gut are key early targets during HIV infection and their depletion is a harbinger of disease progression. Researchers were able to "mask" these cells by using an antibody against α4β7 integrin, a molecule that promotes these T cells’ homing to gut-associated lymphoid tissues. The antibody does not eliminate the T cells, but it prevents them from homing to the gut and also blocks their interaction with infectious virus. A previous study of anti-α4β7 treatment in acute SIV infection found that it could reduce viral load and boost the recovery of the immune system, while control animals’ SIV infection progressed. In the Nature Medicine report, researchers examined the effect of targeting α4β7 integrin in a model where female rhesus macaques were repeatedly challenged once per week with HIV’s cousin SIV intravaginally. Ten out of 12 control animals became infected. In contrast, only one out of 12 α4β7-antibody-treated animals became infected by week five. Five more became infected by week eight, and six of twelve remained uninfected. The researchers calculated that anti-α4β7 treatment leads to a 2.7 fold decreased risk per challenge. "Masking α4β7 integrin may be preventing transmission by suppressing the spread of a nascent genital infection to the gut, where large numbers of vulnerable T cells reside," Ansari says. The research was supported by the NIAID extramural (AI098628) and intramural research programs and by the NIH Office of Research Infrastructure Programs (Primate centers: P51OD11132).